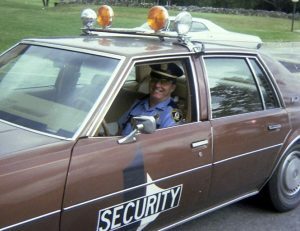 Author’s note: While a student at Bryant College in the late 1970s, I worked for the campus security. It was a peaceful evening in September of 1979, and Sergeant Jack Currier of the Bryant College Security Department was on foot patrol in the Townhouse Village when the upper windows of a unit in G-Block suddenly exploded outwards followed by sheets of flame. Currier radioed for the fire department before entering the building to search for victims, but intense heat and smoke drove him back into the street. The fire began to spread to an adjacent unit, but fortunately there were no injuries, for the residents of the burning townhouse weren’t home, and others evacuated safely. The cause of the fire was blamed on a smoldering cigarette ash on the couch. It could be said that the Bryant campus is a community, and the incident mentioned illustrates the need for those to keep it safe. Today the campus is patrolled by the Bryant University Department of Public Safety, a professional organization that provides 24/7 protection by being the first responders to all on-campus emergencies and calls for assistance. As such, the job entails certain risks, for they never know what they might encounter. The same was true in the early days of the department’s history, when the world, and the campus, were much different than today. When Bryant’s Smithfield campus opened in 1972, the town was more rural, and the campus more isolated. Route 7 was a two-lane road, and the intersection of Route 116 was regulated by stop signs. There were no hotels, industrial park, or business plazas between the college and Route 295. Initially, the college contracted with a private security company, but for various reasons the arrangement didn’t work out, so a permanent campus security department was established. At the time, Bryant had a criminal justice program as part of its curriculum which included students who lived on campus. Some of these students became the first members of the Bryant College Student Patrol, the first public safety agency for the college. The new Student Patrol adopted uniforms similar to those worn by the Smithfield police at the time; light blue shirts, dark blue pants, and “Smokey Bear” Stetsons. The department’s first chief was Robert Gardner, a retired San Diego police detective, who along with three sergeants supervised the part-time student patrol. Gradually more full-time positions were created and within a relatively short time the name of the organization changed from “Student Patrol” to “Security”. By 1978, the department had about an equal number of full-time officers and part-time student patrolmen. Student positions weren’t limited to criminal justice majors, but few outside that major applied. The pay was $2.69 an hour, and it was the highest paying job a student could get on campus. Full-time officers received much better pay with benefits. Training to be a campus security officer in the 1970s was minimal. A new officer would be assigned to a senior officer for a few days to be given instruction, and then be put on his own. The campus population was relatively small compared with today, and the job for the student officer was particularly difficult for they were often dealing with peers or classmates. In the late 1970s, Smithfield’s fire department relied on volunteers between the hours of 5 p.m. and 8 a.m., which meant response time to Bryant during those hours could take 15 minutes or longer depending on weather and availability. This situation led two student patrolmen, Jeff Hutchinson, and Mike Cei, to establish the Bryant College Emergency Medical Technician’s Association, which enabled on-campus volunteer EMTs to be available as first responders. This organization was run entirely by students who became certified EMTs by attending night classes at C.C.R.I. in Lincoln, at their own expense. Two EMTs were scheduled for duty at all times, day and night. Each carried a pager that could receive radio transmissions from the security department – very hi-tech for the time. When needed, the dispatcher would “activate” the pagers and advise the EMTs where they were needed. The security patrol car would carry first-aid equipment to the scene. The EMT Association was disbanded in the 1980s. One duty of the security officers in the 1970s was to investigate all fire alarms on campus. In most cases they were accidental, or due to a prank, and once the “problem” was found officers would re-set the system. Today the fire department responds to all fire alarms. During the mid-1980s, the security department stopped wearing uniforms and adopted a dress code that included a blue blazer, tie, dress shirt, and slacks. A small patch worn over the left breast pocket of the shirts and blazer was the only identifying insignia. A few months later the department name was changed to “Public Safety”. It was also in the 1980s that the college discontinued its criminal justice program, and thus, as student patrolmen graduated, they were replaced by non-students. In August of 1992 the Department of Public Safety once again began wearing uniforms. The Bryant campus has more than doubled in size since 1972, and it continues to grow. Campus life has changed too, for today’s students and public safety officers have to consider issues that didn’t exist in the 1970s. As such, today’s DPS officers are far better trained then their predecessors, and their training is always on-going. Modern technology affords campus residents and employees a safer environment through surveillance cameras, and emergency call stations. At present, the department is administered by Director Stephen M. Bannon, a retired Rhode Island state trooper, and his second in command, Captain John Rainone both of Smithfield.